May 11, 10 a.m., a Saturday morning that couldn’t have been prettier, we gathered for the Ouachita Mountain Boys’ walk to Dripping Springs just north of Hot Springs. The rendezvous place was across the road from Kai Schulz’s house, and he came out to see what the fuss was about, and by the time we started on the trail, Kai and his four children were members of the group: Cade (13), Ava (11), Garrett (9), and Lana (7). ANPSers were Mike and Peggy Burns, Don and Lynda Ford, Bruce Hinton, Becky Hardin, Melissa Woods, John Sutherland, and trip leaders John Simpson and Eric Sundell, plus two couples from John Simpson’s breakfast bunch, Dave and Ann Hair and Larry and Glenda Field. We needed only the French horn and kettle drums for an historical reenactment of one of Linnaeus’s botanical forays with his University of Uppsala pupils. The trail was delightful and colorful, with baby blue eyes (Nemophila phacelioides), false dandelion (Krigia biflora), beebalm (Monarda bradburiana), downy phlox (Phlox pilosa), and lots more. But the trail was only the means to an end at Dripping Springs, a high wall of wet rock hosting a lush, green, vertical garden of moisture-lovers: mosses and thallose liverworts, cinnamon ferns, southern lady ferns, and netted chain ferns, maleberries (Lyonia ligustrina), umbrella magnolias, and near the top and in full bloom, several pink wild azaleas. At eye level, a phoebe’s nest was built on a narrow ledge under a brow of rock. Across the trail grew a thicket of scouring rush, Equisetum arvense, and in the same neighborhood, a population of the uncommon white violet, Viola primulifolia. 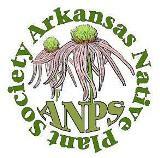 Altogether a perfect ten on the ANPS BOP (Botanical Outing Pleasure) Scale. The afternoon was devoted to the Trap Mountain walk to see the Arkansas twistflowers (Streptanthus maculatus subsp. obtusifolius) that John Simpson had found in bloom only a day or two earlier. John had promised a rare, wonderful sight, so expectations were high. We were not disappointed. 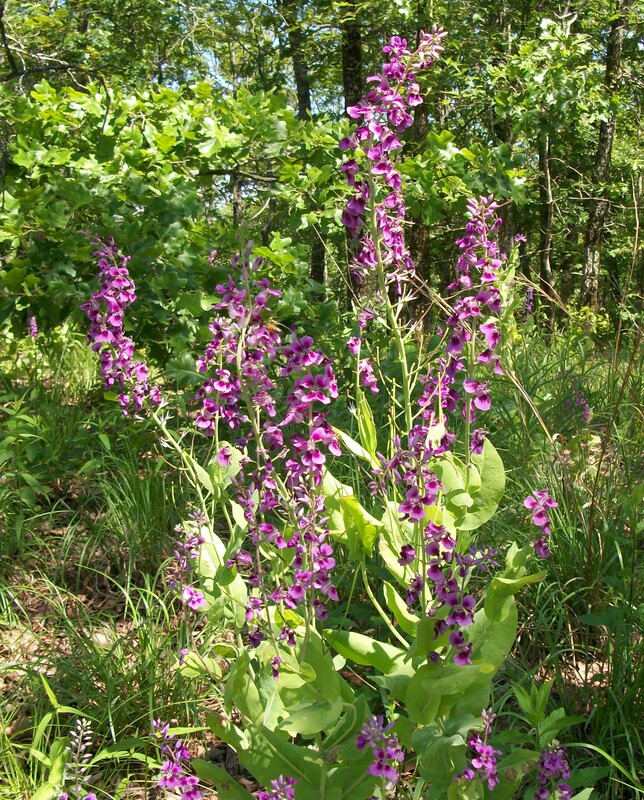 The open pine, oak, and hickory woods of the summit ridge sheltered a dense stand of plants in full flower, as spectacular as any prairie in bloom, but all one color of rich, dark purple. Twistflowers, from one to five feet tall, monopolized the understory of the ridge top. Thanks to John Simpson for scaling Trap Mountain twice in one week. Like Ted Williams at bat, his timing was about perfect. 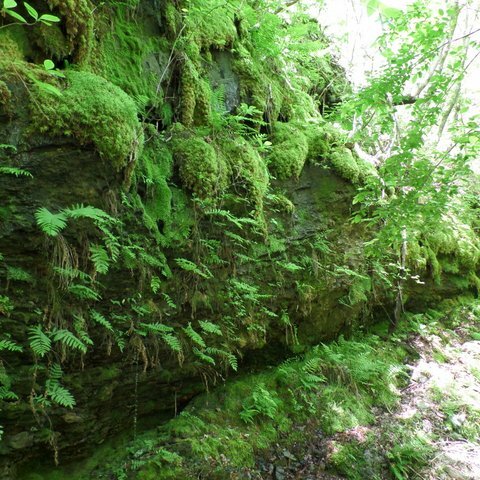 This entry was posted in Ferns, Field Trips, Native Plants, Trees, Wildflowers and tagged Arkansas twistflowers, Brassicaceae, Dripping Springs, Fern, Magnolia, Magnolia tripetala, Magnoliaceae, Strepanthus, Streptanthus maculatus, Trap Mountain. Bookmark the permalink.